Melasma is the most common hyperpigment disorders in Asians. Consultation for treatment of this disfiguring condition accounts for more than 40% of aesthetics consulltation in Asian countries. Pathogenesis of this condition is complex and relates to genetic, sun exposure , hormonal factor, subclinical vascular reactions, etc. Clinically the lesions occur in middle age women on sun exposure area of face especially on cheek, forhead and upper lips. The common presentation is bimalar and centrofacial types. The lesions start as a brownish asymptomatic irregular border macules. The lesions slowly spread out forming brownish patches. Later on the color changes to grayish brown with indistinct borders. This disease mainly effect women(female to male ratio=9:1). Eventhough spontaneous remission after menopause happens but in most of the patients the lesions persists for decades. Melasma has been one of the most difficult hyperpigmented lesions to be treated espeicially in colored skin of Fitzpatric’s skin type III-V. Eventhough total clearing upto 60% of cases is possible with long term triple–combination agent formula(hydroquinone+retinoic acid+ topical steroid). This treatment result in only temporary clearing with possibiltity of complications and common recurrence. Eventhough laser had been introduced for treatment of hyperpigmented lesions for more than thirty years. The early results after ablative laser ,continuous yellow light laser or high fluence nanosecond pulsed laser had been disappointing. Only recently that new high energy nanosecond-pulsed infrared laser with flat beam profiles technology(laser toning) has been employed with fair to moderate result. About 1/3 persited or recurred. These cases had been shown to have abnormal dilated blood vessels in the lesions. Preliminary study had shown some response to treatment with long-pulsed Nd:YAG laser. 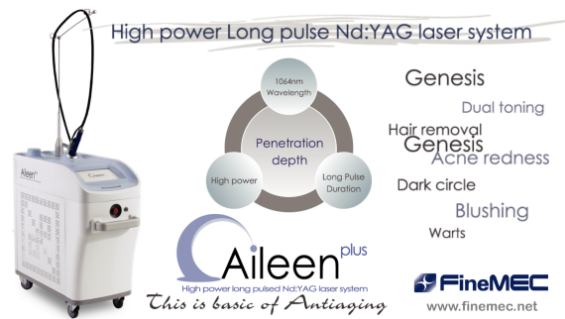 Aileen(Finemec, Korea) is a new high power, flat beam 1064 nm, long-pulse Nd:YAG laser has been evaluated for treatment of this vascular lesions in melasma. In melasma genetically predetermined clones of melanocytes on specific facial areas which are stimulated by ultraviolet light, oxidative stress and aging became hyperactive and proliferate. The normal pathway of melanin synthesis is being stimulated leading to hyperpigmentation. Melanin granules are synthesis in epidermal and follicular melanocytes by stimulation with ultraviolet light especially in the range of UVA(320-400 nm). UV stimulation of keratinocytes leads to activation of binding of keratinocytes and melanocytes through specific binding proteins and receptors(SCF, Stem cell factor and C-kit proteins) stimulation. This lead to releasing of epidermal cytokines(endothelins). Epidermal cytokines released from keratinocytes stimulate vascular proliferation, and hypermelanization. Endothelins will bind to endothelin receptors on melanocyte cell membrane. These cytokines are potent stimulator of tyrosinase enzymes synthesis. Endothelins stimulation leads to increase in melanin synthesis in melanosomes. The mature melanin granules(Stage IV to V) in melanosomes are then transferred to keratinocytes(epidermal melanocyte unit). Melanins granules in keratinocytes are shedded daily. In order that melasma lesions are clinically stable, hyperactive state of melanin synthesis are continuous maintained for long period of time. Vascular dilatation and endothelia cells proliferation results in telangiestasia which is common finding in long standing melasma. Leakage of vascular components lead to activation of arachidonic acid and prostaglandins synthesis. This result in stimulation of melnization and vicious cycles of more vascular proliferation. This visious cycle is the driving force for persistence of melasma. Any treatments that damage basement membrane resulted in dropping of melanins and melanophage formation. Melanophages persist in the dermis for many years before slowly migrate out from the lesions. Figure 1. 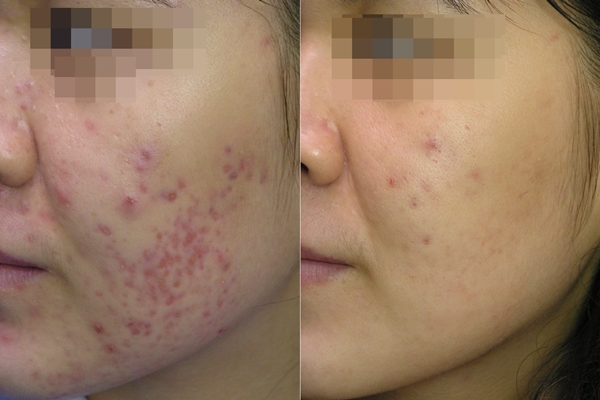 Before and after four Aileen laser treatment of post acne redness. In Asian’s skin(Fitzpatrick’s skin type III to VI), there is a wide range of melanin synthesis, aggregation and distribution leading to different shades of brown colour. The darker the colour the higher density of mature and large clumps of melanins. These melanins distribute in both keratinocytes and melanocytes. Only at some specific locations, melanocytes develop greater response to ultraviolet light resulting in epidermal hypermelanization. These hyperactive melanocytes will also proliferatel and populated the areas. Large melanized melanin(stage IV-V) were detected in epidermal melanocytes and keratinocytes. Usually in normal skin these mature melanin granules will be found mainly in keratinocytes. More than two third of the cases of melasma, macrophages containing melanin granules(melanophages) were detected in upper dermis. These result from dropping of melanin granules through damage basement membranes into dermis. Basement membrane damages were result of treatment with many topical agents or past treatments especially ones that damaged basement membrane e.g. chemical peel, ablative laser, high energy pigment selective laser etc. In some cases telangiectasia of dermal vessels may play important role in chronicity of lesion. Vicious cycle of prostaglandins synthesis through leakage of telangiectatic vessels may be the cause of persistent melanin synthesis. In order to treat melasma effectively for long lasting result we should be able to control epidermal melanin synthesis , reduce melanins aggregation in both melanocytes and keratinocytes, increase melanins transportation into keratinocytes , mobilize melanophages from the dermis and reduce dermal telagiectatic blood vessels. This is not possible with single treatment method. From theoretical point of view melasma especially mixed, telangiectatic, rebound or dyschromic types are justified for combination treatment.